It is a bright and glorious Thursday. I woke up excited to continue on My Garden Tea preparation. What really brought this project on? missing their loved ones right now. I feel more strongly that life is precious. Because we are here now! So My Garden Tea is about celebrating life! Here are some possible fabrics for chair seats. Not exactly what I was thinking, but close. My daughter gave me a brilliant idea for the frame....Yay! For this, I have found a cheap table, a couple chairs and other odds and ends. I am hoping to create a tent inexpensively too... that is still brewing. work...like sanding, and repairing the chairs. $40 for 40 pieces at a thrift shop two years ago! 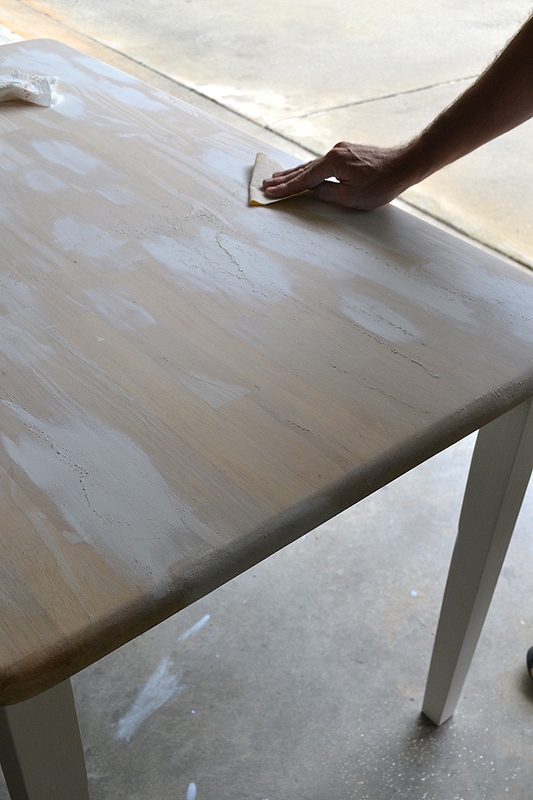 I am working on the second chair and final coats of paint on the table. Here is a recent swap I did with a wonderful group of creative people. Kimberly at ArtJoyStuff, hosted her "Fabric of Nature" ATC swap. Here are all the ATCs I received! Each one of these cards is wonderful! This was the creative way I decided to display them. Thank you so much Liz, Carolyn, Amy, Marsha, Marlene, Becky, Maggie, Karla,Jewels and Kimberly! 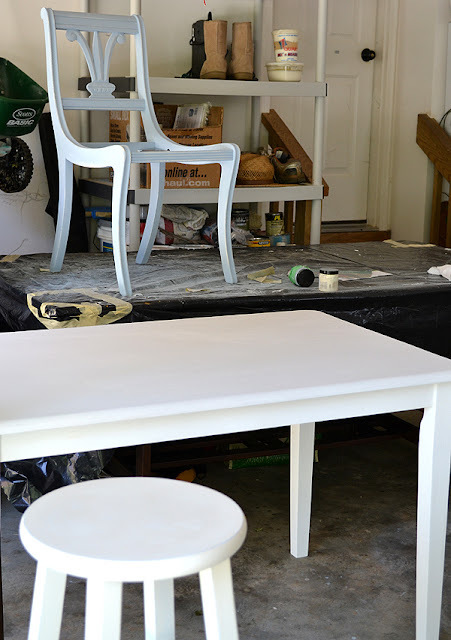 Do you have a JoYful project for this summer? Would you like to join in My Garden Tea? So sorry I had to miss this swap. Such beautiful creations! 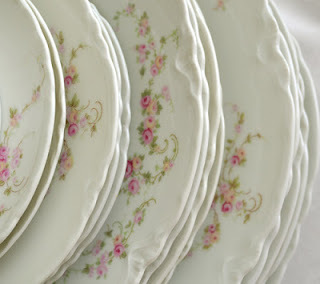 I am preparing for my outdoor tea party as well and will post about it soon. You are making wonderful progress! Yes, I agree with you, we need to celebrate life. I'm enjoying all the sneak peaks. Your gifts are all so lovely and I love how you have displayed them. I also love the fabric you have selected and the frame is rather special! I LOVE how you think Terri! Yes, we should all experience all the joy we can everyday because we don't know when it will be our last. 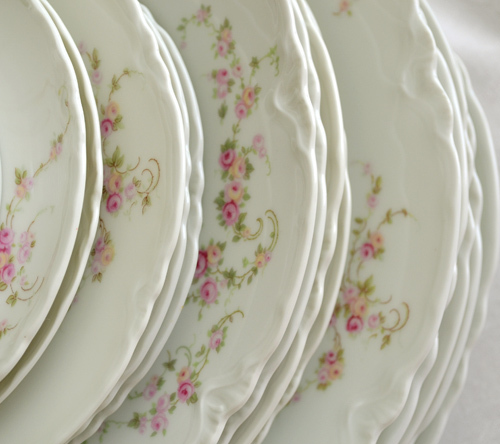 I adore the fabrics you are deciding on AND those dishes are GORGEOUS! I am hoping to celebrate with you - but with all the rain we've been having in the PNW and the continuing rain forecast, I may have to have my garden party indoors. Not to worry - we are used to this kind of rain and lots of things get done indoors that would usually be done in the garden. I have new flowers to pot up - so they might be coming indoors to be in the tea party too. Love the fabrics you've picked - I'm planning on making some pretty flowered cushions for the deck (or indoors) for the tea party - this is fun!!! When I lost my dad over 20 years ago, is when I too realized that today is tomorrow and I never forget that anymore. I so understand your words. Thanks for the sneak peek, I too found a few goodies, how fun. Love how you displayed the ATCs, blessings. I love your good attitude...and your creations.....and your love for All Things Tea, too. I sure enjoy your posts, Terri. Have a wonderful, safe and happy holiday weekend. Hugs. j'ai très mal aux jambes ! the color and the rose on the fabric is shabby chic. Love the atc's and can't wait to see your completed project. Have a wonderful Memorial weekend! what an all around lovely post Terri. I love those fabrics and dishes!! You're going to have such a beautiful space. Looks like a great swap-beautiful cards. I so agree with you- we must live in the here and now, never forgetting to smell the roses!!! At least we have to try learning to do so every day!! 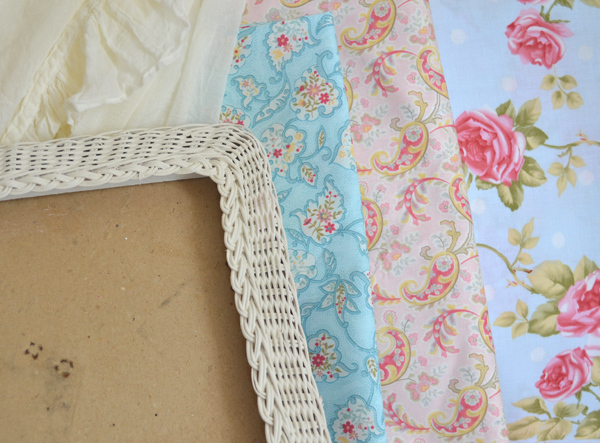 Your fabrics for the chairs looks beautiful- I love the blue one with roses- but they are all lovely, and your table looks totally new now- also the little stool- wonderful with white paint! Wonder what you will do with the frame ? wicker frames and chairs are one of my loves :-) and the plates -OH they are adoraBLE Terri- and then for that price !!! Lucky you ! !-This party will be the most amazing one this summer, I`m sure !! The swap dear Kimberly organised gave you so many beautiful tags in return for your own lovely ones- they looks wonderful in your metal holder! You are so right when you say we must live now and not postpone joy! Life goes so fast.... Thank you for your sweet words on my blog. I love your blog and all your lovely ideas and creations!! Terri, everything is so pretty! Can't wait for the tea party! 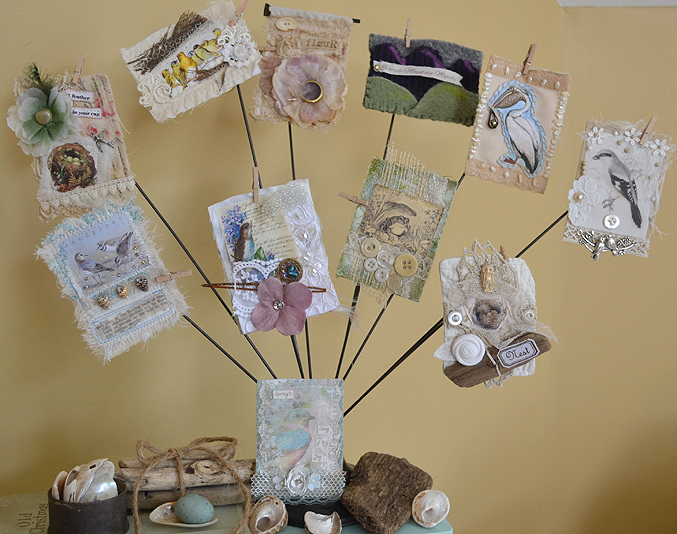 What a lovely way to display the ATCs from the Fabric of Nature swap. I was delighted to receive your ATC in my swap package alongside all the other beautiful ATCs. I am swooning after catching up with all your projects. I can so relate to your "celebrate joy now" philosophy. I have lost my mom, very dear friend unexpectedly and my sweet dog in the last 6 weeks and it has numbed me. Seeing your plans for a garden tea has perked me up and I cannot wait to see your beautiful tent. Love those pastel chairs and all your lovely china. What a wonderful idea. Thank you for all that inspiration!